AUSTRALIA IS SUCH a huge country that you have completely different weather in different places at the same time. In Darwin, during winter, temperatures range from a maximum of 30 degrees down to a very pleasant 20 at night. On the same day in Alice Springs, in the same state, it gets down to a damn cold -4 at night. In the summer months, there can be severe fires in the south and category five cyclones in the north. 1. Plan your travel around weather. We all know of the hail storms in Qld and NSW in spring, and fires and extreme heat in the south in summer, not to mention the rain and gales that sweep across southern states in winter. Not being there at these times is the best way to avoid uncomfortable conditions in your RV. 2. If you are not on a tight schedule, use the four-day forecasts on www.bom.gov.au to plan your travel. This can save you fuel if you avoid headwinds, and can also save you being stuck in areas affected by storms and floods. 3. 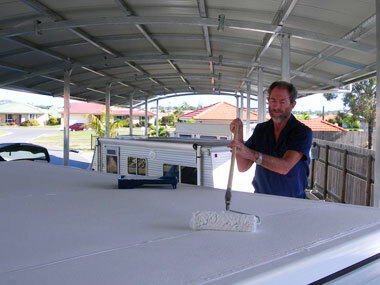 For travel in very hot weather, I can recommend painting your RV roof with a quality insulating paint. Ours has now been painted for five years and is still very effective, as well as waterproofing the roof. If purchasing a new van, install decent insulation and consider a pop-top, as they are cooler in hot weather than a full van. Try to have your fridge installed under your awning, rather than the other side, and a window over your bedhead is a good idea. Air-conditioning is always an option, as are fans; both 240V and 12V can be handy when camped offroad. 4. When heavy rain is forecast, particularly overnight, we roll up our awning – we have seen several collapse after filling with water, causing considerable damage. In wet weather particularly, we always set our awning down one notch on one end to encourage water to run off, and large awnings benefit from curved roof rafters. 5. In regards to hail, close attention to the weather forecasts can help you to avoid areas where severe storms are forecast. If the worst happens, and you are caught with a storm approaching, some caravan covers advertise that they offer hail protection and we carry two old double sleeping bags that we plan to zip together and tie over the car to protect it as far as possible. Our insulating roof paint also provides some protection against hail. Also, it's important to note that a fibreglass van generally will suffer less damage than an aluminium van. 6. Even if it isn’t particularly windy, we always run a guy rope off each end of our awning and peg it firmly into the ground. One year at Camooweal on a hot, still day, a willy-willy appeared out of nowhere and we were left swinging off the corners of the awning trying to hold it down. Some insurance companies now do not cover awnings with storm damage. When there are bad storms around, we find it easier to roll up the awning anyway, rather than be woken at night by the awning flapping and trying to destroy itself. When caught in severe storms, the windage of the van can be greatly reduced by lowering the pop-top; this also stops rain splattering in through the zips. 7. 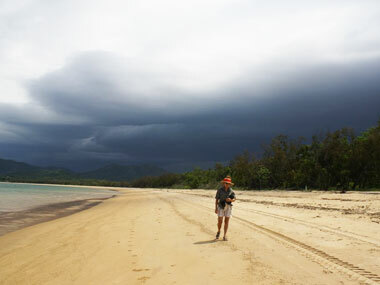 In the case of cyclone warnings, try to get the hell out of the place before it arrives. 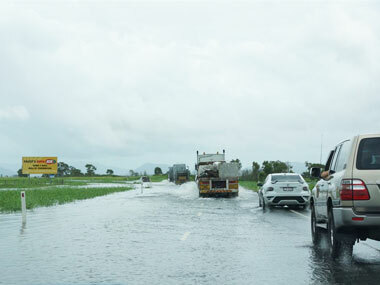 Remember that the worst wind is to the south of the system, so do not head south and you need to go a fair way inland to be safe, for example, Atherton and Tinaroo suffered considerable damage in Cyclone Larry. 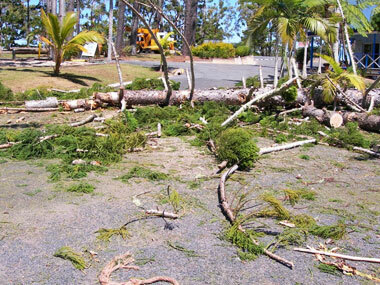 If you cannot leave, some cyclone hotspots have tie-down points in the caravan parks. Take advice from locals on the best way to tie down the van. Make sure your van wheels are chocked, as well as tying the van down to star pickets. reverse-cycle air-conditioning, a fan heater and an electric blanket. If travelling extensively in cold climates, a diesel heater is worth considering. Never use the gas stove as a heater because of the risk of carbon monoxide poisoning. 9. Always be prepared for bad weather. Carry a couple of days’ supplies and water in case you are held up. Keep your vehicles, tyres and batteries in good working order and fix any leaks promptly to avoid further damage. 10. 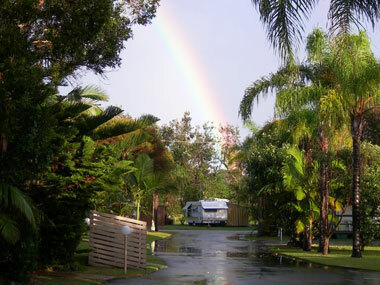 Remember that althoguh spending a week in unremitting rain or biting cold can be miserable, it makes us appreciate the rest of the time, when the weather is perfect for RV touring. Share your top weather tips below.